By Marcus Richardson: Trainer Freddie Roach is coming up with plans for his fighter WBC middleweight champion Sergio Martinez (46-0-1, 32 KO’s) to attack the body of Sergio Martinez (49-2-2, 28 KO’s) on September 15th to take the fight out of him. Chavez Jr. needs to be able to work on the inside against Martinez somehow because that’s probably the only chance that the 26-year-old Chavez Jr. has of winning this fight. 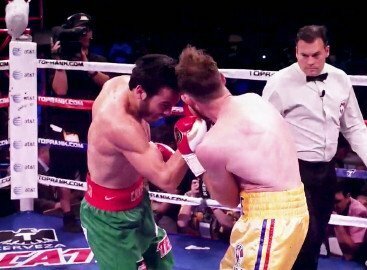 Chavez Jr. is not going to be able to beat Martinez by exchanging big shots from a distance. That’s not Chavez Jr’s game. He’s strictly an inside fighter, and if he can’t get that going he’s pretty harmless. The only way Chavez Jr. can trap Martinez to work on his body is if the ring is small like it was in Chavez Jr’s last fight against Andy Lee in El Paso, Texas last June. Additionally, Chavez Jr. will have to keep the pressure on Martinez by cutting off the ring and forcing him up against the ropes by bumping or pushing him. I’m not so certain that will work, but it’s likely Roach will invest in trying to get Chavez Jr. to use that strategy. The bumping and shoving are things that the referee will need to watch out for in this fight, because it could get way out of hand if Chavez Jr. is unable to trap Martinez the normal way by cutting off the ring. The problem Chavez Jr. has is he’s not very fast of hand compared to Martinez, so that even when Chavez Jr. does trap Martinez, he’s going to be eating a lot of straight left hands from Martinez. If Chavez Jr. can walk through these shots it’ll help, but Martinez isn’t going to stand in one place and let Chavez Jr. work on his body like many of Chavez Jr’s recent opponents have done. This isn’t Andy Lee that Chavez Jr. is fighting here nor Marco Antonio Rubio. It may be that there isn’t plan that Roach can come up with that will work for Chavez Jr. It seems like the best strategy for Chavez Jr. to win the fight is for him to just come in as heavy as he can usually does and hope the weight will be too much for Martinez. The danger here is that Chavez Jr. might fail to make weight or end up weakened from losing all that water weight and putting it back on within 24 hours. Somehow, Chavez Jr. has been able to put huge amounts of weight back on after making weight for the fight, but it could hurt him in this fight. He’s looking a cruiserweight right now with only a little more than a week to go for the fight.